Orginal and larger sized image. The “Green and Gold” are land, the rest is ice. One of the highest continents in the world is largely a mountain of ice stuck on island peaks. Both of them well worth a read! UPDATE 3 Nov 2009: I’ve added temperature charts for Antarctica without the Base Orcadas “Antarctic Wannabe Island” and for different sub sets of the continent. These are just “glued on” as data blocks at the bottom of the article at this point. These data are based on the Antarctic thermometers that are in GHCN (which are very few) plus the data added by GIStemp in STEP0. Those additions are simply merged in that step (no changes, interpolations, etc. are done until later steps). I’ve chosen to use this merged data since otherwise there would not be much Antarctic data to use. It is directly downloaded from the Antarctic research sites, so it ought to be about as good as you can get. For all the Hoopla, noise and fury surrounding the Antarctic and it’s supposed risk of melting, not much is going on. We have the usual migration of thermometers from one initial site to many (with the temperature series drifting in proportion to latitude changes). There is a stability point reached when the number of thermometers is large enough to begin fairly sampling the whole place. And there has been a mild cooling of the continent since about 1993. Antarctica is not warming, it is a cold pile of ice, getting colder. Frigid ice on the rocks. The temperature history is relatively short, and the variation of temperature with latitude is much greater than in other places. The good news is that the most recent history has had a fairly stable thermometer count. Most likely because it is not filtered through the selection process of GHCN. At about the 1960 point, we get a fairly stable set of thermometers to work with. Any pronouncements about Antarctic temperature trends based on a “baseline” from any time before 1960 is using a fairly far north island, not the Antarctic continent. But from 1960 forward, we ought to have a good instrumental record. That is only about a 50 year history, so the 60 year PDO cycle and similar events can not be seen as ripple, only as slope. Basically, long cycles can seem to be slope bias in a shorter life time line series. Not much to see here, so lets take a look at the actual temperature data. Same as the others. Year, 12 monthly averages of the daily MIN-MAX average, the average of those daily values over the whole year, and the number of thermometer locations (ignoring modification flag) in use in that year. First, notice the “step function” about 1956. Thermometer location can shift these averages by as much as 10 C to 12 C. To the extent a “temperature series product” like GIStemp tries to claim it is erasing all the effects of thermometer change with zones, grids, and boxes; it is claiming that it can find a 1/10 C or even 1/100 C signal in a 10 C noise figure. The bare threshold of hearing is about 0 db (call it 1. Most of us have lost enough hearing that it’s more like 10 db+, but 1 makes the analogy simpler and the difference doesn’t really matter.) A Jet Airplane from a bit of a distance away, or a rock band, will be about 100 db. So the 1 : 100 ratio of a nearly inaudible whisper at a rock concert or on the tarmac of the airport with a jet taking off is the kind of “signal” that GIStemp is claiming to resolve in this temperature noise. From what I’ve measured in the code, it is largely an amplifier, not a filter, anyway. I see no way possible for it to have 1 : 100 attenuation of the noise without losing the signal in the process. But back at the data. Once we have a bit of stability in thermometer counts, in 1959 at about -18 C, we can watch the temperatures rise to -14.9 C in 1981 then drop back to -19.4 in 1999. There appears to be about a 20 year “ripple” in the data, but the baseline is a bit short to say for sure. We can also note that when the 1998 peak of heat in the USA hit, Antarctica was in a fairly deep freeze. Another example of a place that may be counter cyclical to where we measure the most (as Hawaii seemed to be). This is the second example we’ve seen that argues for an oscillating system with “nodes” of hot and cold in different places at the same time. To the extent this is true, we really need to pay attention to the Nyquist sampling theorem in determining how many thermometers are needed to measure the planets’ temperature. Then, what a surprise, we see the “average temperature” modulate directly with thermometer count. Even spiking down in 2005 on a brief recovery in thermometer numbers. There is also a rather spectacular example of how “programmer math choices” can change your results. I calculate the “grand total averages” at the bottom in two different ways. One is the average of all the daily values. The other is the average of the monthly averages of those daily values. Here we see 7 C variations in the monthly averages. So when a simple programmers choice as to “which order to average” can shift a number by 7 C, exactly how much faith can be put in the 1/10 C position? And make no mistake about it, this is only one of dozens of such math specific decisions programmers must make in writing code like GIStemp. And that is part of why I keep repeating that there can be no faith in the 1/10 C position and maybe not even in the whole degrees place. So what stations survived into 2008? There are 5 stations of over 1000 m elevation (this matters), but not a lot with latitude more southernly than -70 (or 70 S ). Who got pitched out from 2005 to 2008? Who would ever have expected that antarctic polar thermometers would also suffer from Polarphobia! It has an average elevation of 2500m. Ought not 1/2 the thermometers be above 1200 m to have some representative sample? WIth that elevation profile, there are not a lot of low elevation “blue” places to put a thermometer at all; and nearly none that are not going to be strongly moderated by all that liquid ocean next to the low elevation coastal area. If you are not at 1000 m – 2000m elevation in Antarctica, you are measuring a lot of ocean and only a little of continental ice field. Still has the “step function” as we discover the interior. Looks mostly flat to me, with a couple of outliers. It is also short enough that the 1988 1989 cold spots might be part of a longer term ripple. Need to look at other segments to get a hint. And it is also possible that “1” thermometer is just in a colder spot than the other three that were added later. Cold. Flat series. Maybe getting a little colder, or a short segment with a ripple. Comparatively warm. Mostly flat and trendless but with a cold droop in the late 1960s to early 1970s. Looks like a cyclical roller to me, we’re headed back to where the series began in the 1950’s (which would make it a 60 year cycle… PDO? the -60 LAT and LONG put it about on the peninsula where the Pacific drains past…) Too bad the series stops in 1983 – 1984. This bit was done with a slightly less refined program (to glue together a list of stations) that does not have proper “data missing” flag handling in it yet. So you will see some “0.0” values. Those were not very warm days in Antarctica, those are data drop outs. If I get time, I’ll enhance this bit of “LIST” code to have the same data dropout flag and handling as the regular temps code. For now, if you see “LIST” in the file name, you know the ‘missing data’ will be playing games… Thus the “amazing warming” in 2004 and 2006. The code works fine as long as a month is not completely devoid of data (and was originally written for large areas like continents where that is never a problem). Looks flat to me. Maybe even cooling a smidgeon. Cold, fairly stable, but with so thermometer count jiggle. Looks flat and cold to me. Lots of data dropouts, though. Which to my eye is reaching in to 2002, adding a year, but has dropped 1986 and 1987, so ends up one data point short (and leaves out that -46 C “warm” start). That leaves the impression of a rapid rise. Despite the modestly flat ‘ghost thermometer’ behind it that is some other station ID. This looks substantially dead flat to me, with wandering between -48 C and -51 C in years with no data dropouts. Yet NASA GISS have a plot that looks like it’s on a rocket ride to increasing warmth with the blue line into 2002. In theory, it’s the same data I’m looking at. And while in theory my copy of the antarctic.txt files is about a year old, it was old data at the time of the source code download (it is in the bundle). So are they taking 6 years plus to put in their 2002 data? But a nice flat -21C with occasional excursions to -24 C, a cold early 1970s, and then it ends in 1978. Somehow, GIStemp gets a map that starts in 1955 at -20C, a 2C fictional warmer (maybe there were doing an Urban Heat Island correction ;-) and extend the set into 1979 at -23.5 in a spectacular collapse. Yet the data start at 21.7, 22.1, 21.9 and end at 21.3, 21.2, 21.2 so I’d have expected the ends to be dead flat, not flipping and flopping all over the place like fishtails out of water… Just amazing, and clearly, given the real data, a complete work of fiction. This one we’ve seen BASE ORCADAS, but where to put it? Maybe warming a little, but we’ve had lots of -3 C in the past. Is there no room for weather? This is an island where the circumpolar current comes out of a choke point between the Antarctic Peninsula and the tip of South America. It then sprays like a nozzle into the south Atlantic where it entrains a warm current on the north side (and I’d expect a counter current circulation to form in the Weddell Sea as the water entrained off shore is replaced by water pulled counter current either westward near shore or up from the bottom. In short, I’d expect all kinds of instabilities in the ocean currents and in the temperatures of the three batches of water (Pacific through shute, Warm Atlantic, Weddell Sea) mix and both the AMO and PDO flip and flop. I certainly would not hold it up as any testimonial to anything other than ocean current instabilities. Theses few don’t exactly match their neighbors in the number sequence. Suggestions welcomed. All just leave them as ‘singletons’ unless someone squawks. I see no way to reconcile the temperatures of the Antarctic with any supposed runaway greenhouse scenario. Heck, they look to me to more directly tied to where you put your thermometer. The Antarctic temperature history is much more consistent with someone playing with the instruments, than with any warming trends. And the graphics are gorgeous; the colors emphasize the beauty of Earth, draw in the eye and the mind. Great choices. Well, there was one…..
Oh, and I am not rushing you, but I am looking forward to another financial analysis! And per “the one”… I thought about it quite a while, but just could not resist the opportunities for pun and parody. And the “beauty of the earth” comes in many forms. Besides, when your basic product is charts of numbers that would put an accountant to sleep, you do need to “punch it up” somehow from time to time! On Markets: Well, I called the ‘get out’ at exactly the right time in the ‘Brazil, Ministry of Stupidity’ posting and in an (unfortunately far too short) one line ‘daily note’ in the last full WSW posting. We’re getting close to a ‘reentry point’, but the signal needs to happen first… But yes, I’m hoping to get the ‘S.America overview, Asia Overview and maybe even a selected Atlantic Islands Look’ done today. That would only leave Europe to do. I really want to get this set done so I can get back to other stuff; but I can’t leave it half done and it can’t be done sloppy. Some I’m kind of stuck with what reality is. In cash, doing my homework, and trying to stay in time sync with both topics. Your dedication here is amazing. This whole can of worms has intrigued me and bothered me to the point where I feel I can’t look at it anymore, and yet I keep coming back to it. Antarctica bothered me particularly. When you look at the spread of stations reporting climate data, a large proportion is on the warming West Antarctic Peninsula. The way GISS deals with the data just shows their whole attitude to climate and world temperature. This is how your data looks on a plot – the temperature data and the number of stations, but with Base Orcadas overlaid. Who he? Well just the whole foundation of the Antarctic record for the Southern Polar Zone from 1903 to 1944. The GISS Southern Polar Zone is 64S to the pole itself at 90S. The (GISS) temperature trend in this zone uses their ubiquitous anomalies and shows overall a warming rate for the region of 0.018⁰C per year, or 1.8⁰C per century. The trouble is, the earliest records in this zone start in 1946 with Rothera Point (a UK station on the West Antarctic Peninsula). Here’s what the overall GISS Zonal data looks like when plotted as an anomaly (differences from average of 1951-1980 base period). The Base Orcadas data is again overlaid. The last part of the figure shows it nicely. It is a plot of the data for the Zonal Mean subtracted from that of Base Orcadas. It shows just how little adjustment there is for the Base Orcadas data before it is used as the Zonal mean. And the worst part is that Base Orcadas is not even in the 64S-90S Zone – it is at 60S, in the South Orkney Islands. It is more than 1300km from Rothera Point. Rothera Point itself is more than 2500km from Amundsen-Scott Base at the South Pole. This is one big continent, and yet data from one station, barely altered, is used to represent the whole expanse for forty-three years. My other gripes with this? How can so many relatively warm areas be used? and was there no adjustment for altitude? A quick glance at the GISS stations used suggests about 40% of them come from the West Antarctic Peninsula, or its associated islands. Only a handful (Amundsen-Scott; Vostok; Byrd and a few others possibly) are not coastal. The others are close to the coast, or near the edge of the permanent ice in summer, so at least coastal in relative terms. And, by the way, the trends for Amundsen-Scott and Vostok are flat. If you plot the whole zone data from 1956 onwards, by which stage more stations have kicked in and there are twenty-five in total, the warming rate is halved. Never in the field of modelling was so much represented by so little for so long. Your dedication here is amazing. So the ‘dedication’ springs from their ardor in pushing their mud pie buffet on me. You made some excellent points on Antarctica. Nice graphs, too. Yes, that is how GIStemp works. It takes whatever it has, from wherever it has it, and spreads it to wherever it needs something. It does this brainlessly and mindlessly, over sequential “reaches” of 1000 km, 1000 km, 1000 km, 1200 km, and 1200 km (IIRC… there might be another one in there I’m forgetting.). Add that up, you get 5400 km. Now there are some limitations in some steps where it tries to keep the ‘reach’ restricted to ‘all it needs’, so you don’t see them all concatenated very often. This whole can of worms has intrigued me and bothered me to the point where I feel I can’t look at it anymore, and yet I keep coming back to it. Train wrecks are like that. How can so many relatively warm areas be used? and was there no adjustment for altitude? It does toss out some records it doesn’t like. It does splice together loads of fragments. It does ‘make up missing pieces’ by ‘guessing’. But it does not apply what we would think of as normal rational selection. What it has, gets spread around, based on distance alone (and the distances it will ‘reach’ are hugh). The issue of Antarctic temperature trends has been addressed in great detail on Jeff Id’s website “The Air Vent” during the last 12 months. It has also been a common theme at Climateaudit. Id & friends have been carrying out an exceedingly thorough audit of a paper by Steig et al that claimed to detect a warming trend across the Antarctic continent. The upshot is that the Steig et al methods inadvertantly smeared a warming trend present in the Peninsula Region across a large part of the rest of the continent. The systematic geographic numbering of sites lets me break out parts of Antarctica from each other. 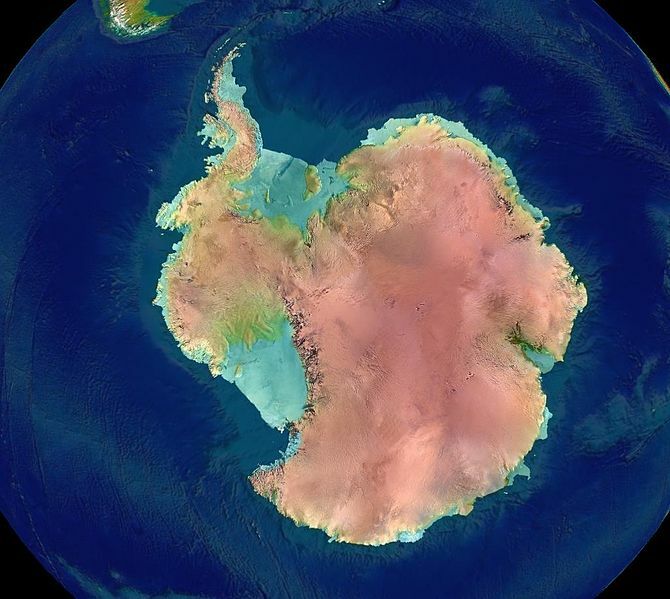 Antarctica is “7”. This divides into 700 for all but one record, and 701 for “BASE ORCADAS” (the one ‘antarctic wannabe’). 73: 7 locations: One is “Nansen Ice Sheet”, another is “Tourmaline Plateau”. Very useful update – great to have all those regions separated. Thank you. I’ll have a go at the numbers later. Re S. Orkney … and the tip of South Africa. I think you mean S. America. I agree. Ed, great work, but you have an error in your discussion of dB- decibels are a logarithmic ratio, defined as y= 20 log10(x1/x2). Thus, a 100:1 ratio in values is only 40 dB, 1000:1 is 60 dB. GIS temp is only claiming a ratio in the range 40 to 60 dB, not 100 dB. In a probe card analyzer in the 1990s, I managed to read leakage currents with 4 picoamp resolution under 20,000 pA noise in the form of 60 Hz AC line pickup… but the 60 Hz noise was very cooperative in being very repeatable, so I could sample repeatedly for a full 1/60 second cycle and subtract the narrowband signal. Thus I achieved about 54 dB of attenuation under fairly ideal conditions. I still doubt that GIS can pull any real signal out of such a mass of nonperiodic noise. Correction, 40 picoamps- lost a zero there. 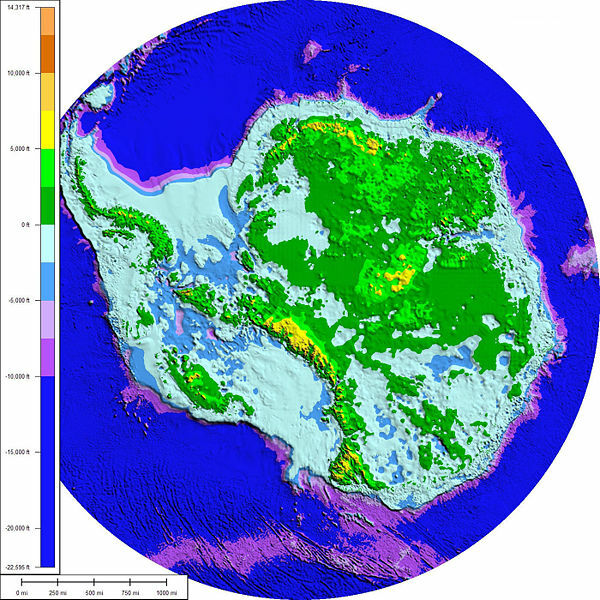 Jeff Id’s post, which I see you also read, inspired me to look at what I’d already done on Antarctica from your work here, and it deserves expansion. I think there is now an opportunity to do that, so I have sent you the file, with ideas.